Disclaimer: The summary and review may contain spoilers if you have not read Unearthly. To read my review of that book, click here. Goodreads Summary: For months part-angel Clara Gardner trained to face the raging forest fire from her visions and rescue the alluring and mysterious Christian Prescott from the blaze. But nothing could prepare her for the fateful decisions she would be forced to make that day, or the startling revelation that her purpose—the task she was put on earth to accomplish—is not as straightforward as she thought. Now, torn between her increasingly complicated feelings for Christian and her love for her boyfriend, Tucker, Clara struggles to make sense of what she was supposed to do the day of the fire. And, as she is drawn further into the world of part angels and the growing conflict between White Wings and Black Wings, Clara learns of the terrifying new reality that she must face: Someone close to her will die in a matter of months. With her future uncertain, the only thing Clara knows for sure is that the fire was just the beginning. I have looked forward to reading this book ever since I finished Unearthly last year. I love these angel stories, because they have just the right blend of angel lore, humor, romance, and intrigue. Even though Hallowed is darker and has less action, Hand still manages to capture all of the aspects that made Unearthly such an enchanting book. After years of preparing for her purpose and then having everything turn out the way it did, Clara wonders what more she can do, or what more she should be doing. It seems as though her purpose may not be over - her visions certainly aren't - but confronting the larger picture may mean confronting her conflicted feelings for Tucker and Christian. On top of this, the visions that Clara is having seem to mean that someone important to her may die sooner rather than later. Clara's world seems to be crumbling around her, and there is little she can do about it. The more Clara struggles with her questions, the more she realizes something - nothing is as simple as it seems. If I had to sum this book up simply, I would say that Hallowed is a book of revelation. Certain things that were only hinted at in Unearthly are explained in much more detail here, especially the angel lore, and I loved this. With all of the new information I felt even more drawn into the world that Hand created, even though some of the revelations proved to be painful. As mentioned before, this book is darker than Unearthly. There is less of the lighthearted romance and more of a struggle of feelings, less of a happy, united family as instead each person tends to keep their own secrets, and the threat of danger is always prevalent. Even still, there are moments of respite, moments where I felt like I could sit back, read, and smile. Finally, there is Clara herself. I really enjoyed seeing how much she grew throughout this book from someone who was focused on what she wanted to someone who could see the larger picture and act accordingly. By the end of this book I felt a much stronger connection with her than I had in Unearthly. One of the things that bothered the the most in Unearthly - the love triangle - I actually really enjoyed in this book. Here more so than the first book, Clara's choice is really about more than just choosing between two guys. We also got to see another side of Christian, which I loved. Tucker is an adorable country boy, but if Christian really is how he appears in this book, I think my heart might belong to him a little bit more. Hallowed was everything that I was hoping for and more. I know that there is much more to come in the third book - more questions to be answered, and an decision to be made - and I cannot wait to see how everything plays out! I have been looking forward to reading this book and after reading your review I am even more excited to read it! Great review! 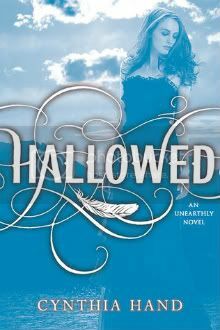 I loved Unearthly so I will definitely have to get my hands on a copy of Hallowed soon. I've heard a lot of amazing things about this one so hopefully I'll get a chance to pick up a copy soon. Great review! I cannot wait until the third book comes out! I hope it's soon! Definitely the best books I've read in awhile! Cynthia Hand deserves major props! Thanks for a wonderful series!